The flowers were blooming at Hickey Creek Mitigation Park in Alva. Still working on my flower identification. In the days and weeks leading up to this trip the weather was looking like it was going to be a wet, rough voyage. Recent weather conditions were contributing much needed rainfall, but these same conditions were not letting up for the weekend. But this didn't deter the Carnival Princess from heading some fifty miles into the Gulf Stream. I met up with Dave and Tammy McQuade on Friday, who were generous enough to offer me a ride, as we all were heading out for the pelagic trip. Expectations were high for getting to see many of the off-shore species. Shearwaters, Storm-petrels, Jaegers, Terns, Black-capped Petrels and maybe even a Tropicbird. We made a quick stop at Nokomis Beach to check-out the House Crow, then continued on to Cape Canaveral. We caught dinner with our event host - Michael Brothers, trip leader - Bob Wallace and last year's Big Year Adventurer - Yve Morrell. Yve had counted some 813 species in North America and Hawaii in 2017. The Canaveral Princess left port on time early Saturday morning and took us out into some choppy surf and overcast skies. It was nice to see a lot of faces for familiar names on board. Met Hugh Whelan from Ft Myers and Dave & Tammy unexceptionally ran into a business acquaintance. 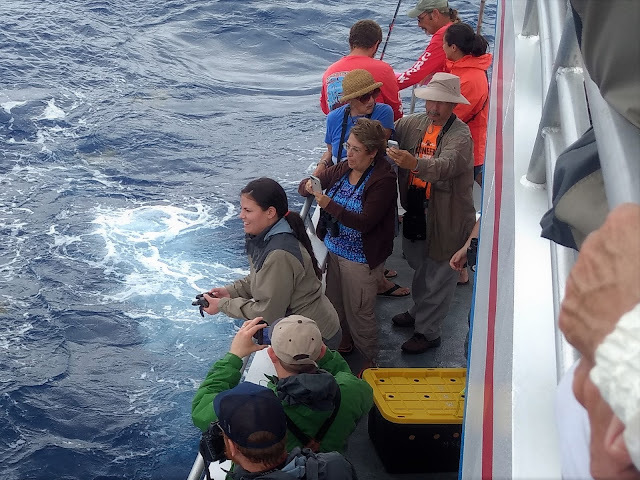 Luckily the seas became somewhat tolerable and we missed the rain for the most part and the birding was a mixed bag. The number of species was a bit low but had some awesome looks at Wilson's Storm-Petrels and Audubon's Shearwaters. Thought we were going to dip in spotting any Black-capped Petrels, but a lone individual was seen late in the day. Sooty, Royal, Sandwich, Black and Bridled Terns turned-up. Missed on seeing any Arctic Terns or Jaegers. Some folks added Banded-rumped and Leach's Storm-Petrels. I didn't take very many pictures on the day, but the following ebird LIST for our group has some nice examples. About the biggest surprise was that the entire crowd on board were greeted by a pair of Common Eiders as the Canaveral Princess docked back in port. We don't expect this species in Florida in May. 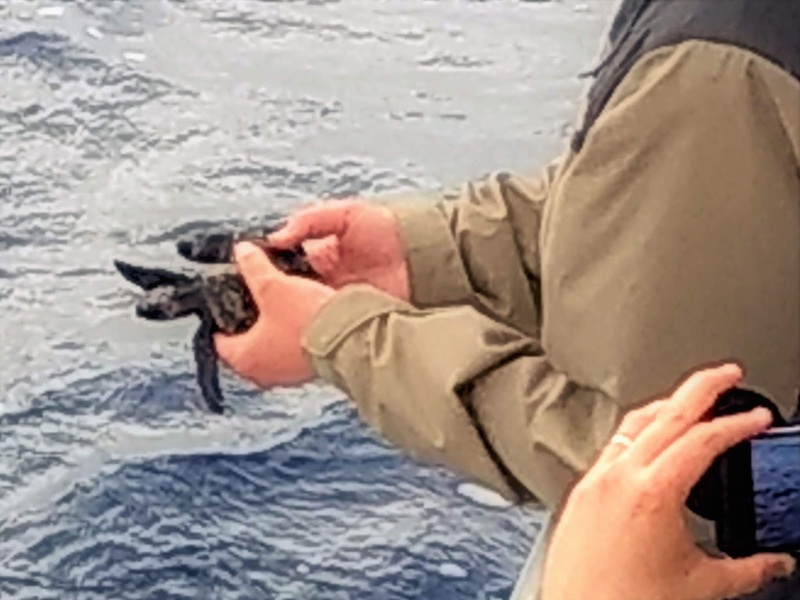 Usually on these pelagic trips, which are an event sponsored for the support of the Marine Science Center at Ponce Inlet, young sea turtles will be released when we reach the weed line in the Gulf Stream. Today we had a pair of 'endangered' young Hawksbill Sea Turtles. Jessie Stein from the Marine Science Center brought the Hawksbill sea turtle wash backs that were released in the Sargassum weed. Sea birds aren't the only draw on these trips. Usually large sea turtles or pods of Spotted Dolphins come along side the boat. Today a few of us noticed a pair of cetaceans. They were probably Pilot Whales which are actually in the dolphin family. Kinda cool. But our weekend wasn't over. Even with rainy conditions continuing on Sunday Dave, Tammy, Yve and I drove Wildlife Drive at Lake Apopka. Our targets were Mississippi Kites and Fulvous whistling Ducks. The kites were a no show. The rains were probably not helpful. We did find both whistling Duck species, Plus lots of Purple and Common Gallinules, Coots, Barns, Bank and Cliff Swallows, Purple Martins, Least Bitterns, Ospreys and Bobolinks. We also added a Pectoral Sandpiper, a Solitary Sandpiper Killdeer and Least Sandpipers. Sanibel Island - Whats Happening at the Bailey Tract? Seems that some of our local birding friends are very unhappy with plans to re-engineer how water is stored on Ding Darlings Bailey Tract. Many years ago this property was a wetlands and home for animals and birds who thrive in marshy environments. But as the Sanibel Island was being developed dirt was excavated from here creating the water-filled borrow pits we see there today. But today a plan is being managed to convert some of these acres back to its former wetlands habitat to support the rare Sanibel Island Rice Rat. 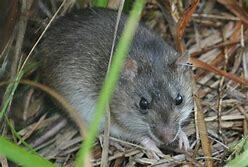 This rodent is a protected sub-species of Marsh Rice Rat totally endemic to Sanibel Island. The filling-in of the Ani Pond, to convert it back into marsh, has stirred up several local birders who have enjoyed the pond, as is, for a great many years. We'll see how this develops. This morning I stopped in at the Bailey Tract. It had been reported that the property was to be closed to the public by now for the re-construction. But it's still open. No doubt due to the presence of nesting Black-necked Stilts raising a family here. Last Thursday I traveled around Sarasota County in search of a few interesting birds. The recent reporting of a House Crow at Nokomis Beach was intriguing. I had been aware of reports from years ago of a pair of House Crows that were living at Nokomis Beach. This is an exotic species from South Asia that has been spreading out globally, some believe with the ability to stow away on freighters to visit new territories. Easily located the House Crow when I arrived at the park about 7:45 am. Then over to The Celery Fields. When I arrived the Purple Martin Houses were being opened to check on the nests. Lots of babies. Out on the marsh Stilt Sandpipers and least Sandpipers were present on the exposed mud. A Purple Gallinule was actively feeding along with Common Gallinules. A Least Tern dipped the water and an assortment of waders were present. Limpkins were also active, a Bobwhite could be heard and an Eastern Kingbird was hawking for its lunch. One last stop was to look for the Tropical Kingbird that has, once again, returned to St Armonds Circle. The location was busy with traffic and shoppers, and then I found the parking lot that the bird has called home is now under construction. I guess they're building a parking garage. The tropical kingbird is around, but I didn't see today. Just Gray Kingbirds and Eurasian Collared Doves. Ended the trip with a count of sixty birds seen today in Sarasota County.